During its 25 years in business, Minnesota-based climbing wall company has positively impacted children's fitness through its dynamic product offering. The fact that we really care...has contributed to our longevity. 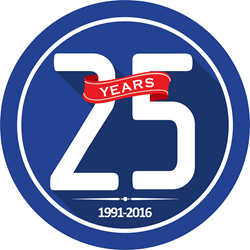 Everlast Climbing, a Playcore Company, is celebrating 25 years in business this year. After getting its start in Chicago as a climbing hand hold manufacturer, founder Tim Sudeith began working with schools to create low-risk climbing walls (Traverse Walls®) that are typically 8-10 feet tall for use in Physical Education classes. After receiving feedback from educators that the climbing walls were engaging students previously not interested in physical activity, Everlast Climbing moved toward developing additional products that would be attractive to more schools and other youth-serving agencies, such as community centers. Everlast Climbing is passionate about helping kids become more active and combating childhood obesity and has developed innovative climbing walls that can be used beyond physical education classes. The invention of its Magna® and Discovery® Dry-erase Climbing walls (US Patents 7,056,266 & 7,520,838) combines movement and learning. Both climbing walls have magnetic properties and come with magnet sets and activity guides. Children are able to place magnets in a variety of ways to add learning to the climbing wall, for example, by placing word magnets next to hand holds and traversing the wall using only the holds with verbs next to them. The Discovery® Dry-erase wall also comes with dry-erase markers, adding more learning opportunities to the wall by allowing students to write while climbing. “Some schools conduct weekly spelling tests on the climbing wall, while others have students practice math facts while climbing,” said Mertyce Mrvos, Coordinator for Programs & Partnerships at Everlast Climbing. “With our climbing walls, schools can add more physical activity into the school day, beyond what children get in physical education classes.” In addition, Everlast Climbing’s walls include color-coded hand holds that vary in difficulty, allowing the climber to choose the desired challenge level. Everlast Climbing is also known for having set the safety standard when it comes to traverse climbing in schools. The company has created many innovations, such as the Red-Relief Line®, a horizontal line of red foot holds specially designed as a reminder to climbers to keep their feet in the "safety zone," only a few feet from the floor. Everlast Climbing developed its safety mats to meet playground industry ASTM standards for both critical fall height and protrusion protection. Further, Everlast Climbing created a Cordless Mat-locking System® (U.S Patents 7,819,778; 7,862,480 & 8,282,534) to prevent unauthorized access when the wall is not in use. Everlast Climbing holds a total of 15 patents related to safety and product innovation. In 1997, Everlast Climbing moved its headquarters to St. Paul, MN, and then a few years later to its current location in nearby Mendota Heights. The company is proud to make “everything but the hardware” in its 36,000 square foot facility. Having the advantage of housing offices and manufacturing under one roof allows for high quality assurance. Further, Everlast Climbing completes its turn-key solutions by offering factory installation by its own team of installers. It is clear to see the passion surrounding Everlast Climbing’s mission. “We only hire people who have that sparkle in their eyes when we talk about the impact we are having on young people,” said Tim Sudeith. “The fact that we really care about our end users comes across in everything we do and surely has contributed to our longevity as a company.” Everlast Climbing works with many organizations that are fueled by the same passions, like SHAPE America, and regularly advocates and lobbies for children’s health and physical education. Everlast Climbing was purchased by PlayCore in 2008 and has enjoyed working closely with a parent company that also values and is committed to making a positive impact on children and communities. By offering a variety of traverse and top rope climbing walls, including specialized walls for pre-school aged children and adaptive programs, Everlast Climbing is striving to meet its goal of making climbing more accessible to all ages and abilities.